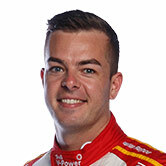 Virgin Australia Supercars Championship leader Scott McLaughlin shaded Rick Kelly in Practice 2 for the CrownBet Darwin Triple Crown at Hidden Valley. 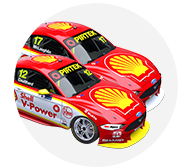 The Shell V-Power Racing driver turned a 1:06.1587s lap late to finish Friday 0.0412 seconds clear, while Jamie Whincup rounded out the top three. Practice 1 pacesetter Kelly put down a stern benchmark on his first flying lap of the second session, a 1:06.1999s. That was, like all efforts at the time, aided by the extra grip afforded by leftover rubber from the preceding Porsche Carrera Cup session. Despite a small mistake on his lap, Kelly was nearly four tenths clear of the pack, with McLaughlin his closest challenger on a 1:06.5769s. Ten minutes later, Shane van Gisbergen trimmed that advantage to 0.2974 seconds, shortly before the session was red-flagged for a stray bolt on the front straight. Running resumed with 30 of the 45 minutes left, Triple Eight using the stoppage to change the flapping ZB front splitters of van Gisbergen and Whincup. Through a pair of improvements from McLaughlin, the gap between Kelly and the rest was back to 0.1350s with 10 minutes to go. As late new-tyre runs started, Whincup edged marginally closer with four minutes remaining as he moved from fourth to second. Kelly was finally unseated with just under two minutes left on the clock by a 1:06.1587s from McLaughlin, who went 0.0412s clear. “We were one of the only ones who got a green [tyre] gain from what we saw,” McLaughlin said. “So that was good, but we just didn’t get that last sector right with regards to [tyre] pressures and a few things. Second still capped a strong day for Kelly, who took a win at Winton last time out in his Castrol Altima. "We’ve got a fast car, but we’re just trying to focus a bit more on the race run, to make sure the car is strong from that point of view," he said. "We did two long race runs, which filled the whole session there, and now we’re keen to debrief that and work out how to go a bit faster." Whincup was 0.1632s off McLaughlin in third, ahead of Michael Caruso in a second Nissan, and Triple Eight’s Craig Lowndes and van Gisbergen. David Reynolds was seventh, while Fabian Coulthard, Andre Heimgartner and the lead Brad Jones Racing driver Tim Blanchard rounded out the top 10. Tim Slade took 11th in the second of the BJR Commodores, while Nick Percat lost time in pitlane tracing a throttle problem and wound up 22nd. The best of the four Tickford Falcons was Cameron Waters in 12th, with Mark Winterbottom 17th, Chaz Mostert 18th and Richie Stanaway 19th. 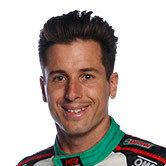 Anton De Pasquale was the lead rookie in 13th in his Erebus Commodore, just ahead of the best of the Walkinshaw Andretti United entries, driven by James Courtney. In a fourth BJR Commodore, wildcard Macauley Jones was 27th, rounding out a field covered by 1.3950s. 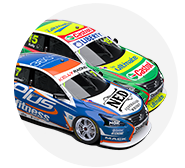 Practice 3 starts at 10:50am local time on Saturday, followed by ARMOR ALL Qualifying at 1:05pm and Race 15 of the 2018 Virgin Australia Supercars Championship at 4:15pm.